Turkey in Europe Drawn from the Best Authorities. 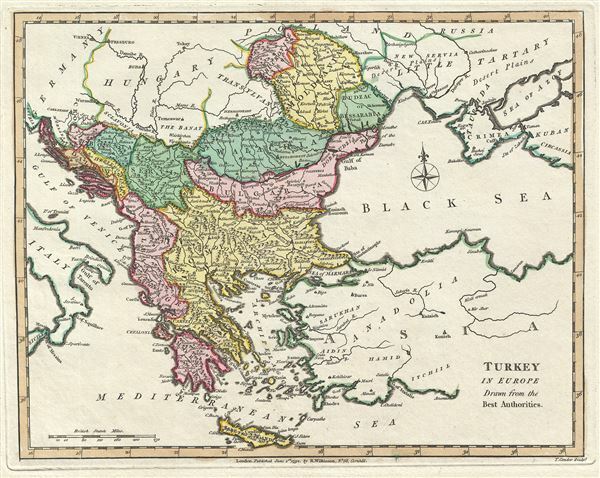 This is a fine 1792 map of Greece, the Balkans and Turkey in Europe by Robert Wilkinson. Wilkinson's map covers from Germany to the eastern Black Sea and surrounding areas, inclusive of the modern day countries of Greece, Albania, Bosnia and Herzegovina, Croatia, Macedonia, Bulgaria, Romania, Serbia and Moldova. When this map was drawn this region was dominated by the waning Ottoman hegemony. The Ottomans would nevertheless continue to exert a powerful influence on this region until the early 19th century. This map was engraved by Thomas Conder and issued as plate no. 34 in the 1792 edition of Robert Wilkinson's General Atlas.